A: We are open 7 days a week from 9:00 a.m. to 8:00 p.m.
A: To ensure availability of the equipment you are seeking, we suggest sending us a reservation request as soon as your travel plans are confirmed. Q: How will I know my reservation is complete? A: After speaking with you, a confirmation # will be generated, and either given to you by phone or by email. You will know your reservation is complete if you have been given a confirmation #. A: Yes! We offer complimentary delivery service throughout the French Quarter. Just reach out to us and we'll work with you to secure the nearest available delivery time to your request. We also welcome guests to pick up reserved equipment at our office, which is centrally located at 941 Decatur Street –in the heart of the French Quarter, just steps from Jackson Square. These guys are local, top rated on TripAdvisor, and sought out by everyone from local school children to celebrities like Brad Pitt and Arnold Schwarzenegger. Their Honey Island Swamp Tours, New Orleans City Cemetery Tours, and Plantation Tours are the best around. For the super adventurous, we recommend a Night Swamp Tour. Another local company. We partner with the team here to provide excellent walking excursions around the French Quarter on their daily ghost tours and cemetery walking tours, which are top rated. Check them out and you’ll see why. Q: Is the equipment sanitized? A: Yes. We make sure that every piece of equipment is thoroughly cleaned, sanitized, and safety checked prior to each rental. Our process includes vacuuming, steaming, and hand washing with non-toxic cleaner. A: We accept cash, Visa and Master Card for our services. Q: Is there a minimum number of days/order amount required for rental? A: We strive to make our rates reasonable to keep rentals within reach of all who need them. For this reason, we've derived rates so that you can rent equipment from just one hours' time all the way up to weekly. Check out our rental items page for details. Q: How will I know how to use the equipment? A: Before checking out equipment, our team provides a general overview of the item, demonstrates how to use each item upon request, and is on call by phone to answer any questions you may have after an item is checked out. Q: Do I have to pay for a lock if I rent a bike? A: Absolutely not. Our bike rentals include a lock, helmet, and light with each rental. There is no minimum rental time to qualify. Q: Why should I rent from New Orleans Rental Services? 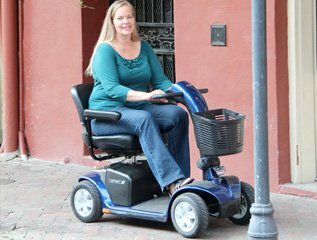 A: As a locally owned and operated company, all of our equipment has been chosen to service the skinny historic streets of the French Quarter, the rolling sidewalks of the Garden District, and everywhere else in between. By reaching out to us, you can rest easy knowing that you are renting top of the line equipment, your best interest is in mind, and that you are supporting local.